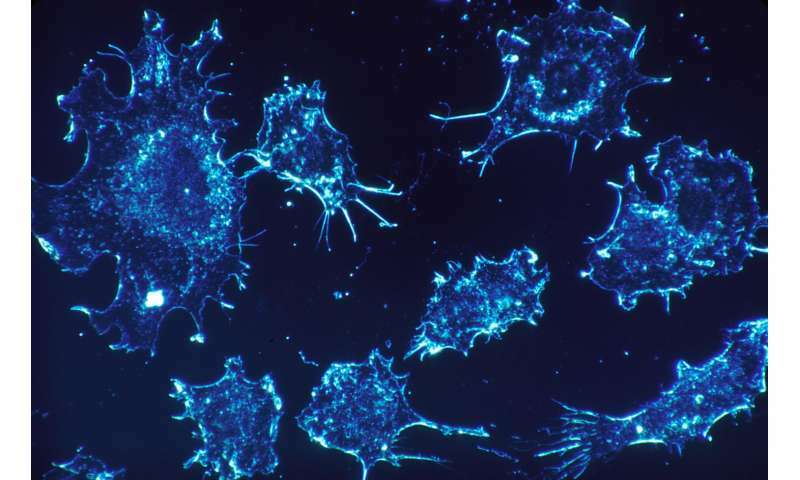 Scientists have just made an important discovery as to how cancer-targeting 'Natural Killer' (NK) cells are fuelled in the body, which has significant implications for related therapies. They found that glutamine—vital for making the energy that fuels tumour cell growth—is not an important fuel for making energy in NK cells, which instead primarily use glucose. As a result the door is now open to targeting glutamine metabolism in tumour cells, as any drugs that do this will not hinder our cancer-killing NK cells. The scientists, led by Ussher Assistant Professor in Immunometabolism at Trinity College Dublin, Dr. David Finlay, have just published their findings in leading journal Nature Communications. In the paper, they report their new and unexpected insights into the fuels used by NK cells to generate the all-important energy that allows them to kill tumour cells. These findings have important implications for certain cancer therapeutics under development by the pharmaceutical industry. NK cells are immune cells that play an important role in our defence against cancer, as they can directly kill tumour cells. Once activated, NK cells increase their intake of fuels and generate more energy, which facilitates a boost in their tumour-killing capabilities. The new research shows that activated NK cells do not use glutamine, a fuel commonly used by cancer cells, to generate energy. This discovery will be welcomed by a number of pharmaceutical companies currently developing drugs that target the cellular machinery that converts glutamine into energy. These anti-cancer agents result in tumour cell death, but until now, it had been unclear whether they may have also reduced how effective NK cells were in the body. Talking about the research, first author, Research Fellow in Biochemistry at Trinity, Roisin Loftus, said: "Our findings are exciting because they identify an important difference between cancer cell metabolism and NK cell metabolism, and they show that drugs targeting glutamine metabolism will not affect the ability of NK cells to kill tumour cells." Interestingly, while the scientists discovered that glutamine is not a fuel for NK cells, they know it still has an important role to play in fighting cancer. This is because it acts as a signal to turn on a biological switch called 'cMyc' that allows NK cells to increase their metabolic machinery, and their capacity to make energy. Because some cancer drugs under development target the machinery in tumour cells that convert glutamine into useable energy—not glutamine itself—there is a chance that these drugs will deliver a relative one-two punch against cancers. Dr. David Finlay said: "Because the drugs targeting glutamine metabolism will prevent tumour cells from using available glutamine, this will lead to increased amounts of glutamine that are available to NK cells. So we actually think that these drugs might boost the anti-tumour actions of NK cells by turning on cMyc, as well as by shutting down the metabolic machinery in tumour cells."